Throughout the years I never have been able to quite decide whether making resolutions was something I wanted to do. I've gone through all the typical ones like stay fit, drink more water and be happier but honestly they have never worked for me. During December I sat down and had a really good think about what is was that I wanted to get out of 2016, both blog wise and personally and I think I've been able to come up with some manageable goals for both things so I thought I'd share them with you today, the first day of a brand new year! This is something that I started doing more towards the end of the year and I definitely want to continue doing so. When I first started blogging I always got plenty of comments and I probably commented on every other post that I read. These days I find myself complaining about not getting as many comments or general interaction and then I realised that I can't really expect that of others if I'm not commenting myself! I haven't set myself a specific goal for this but a few comments a day to start off with should get me going! When I jumped on the bandwagon and found out what my 9 most popular posts on Insta were in 2015 it also showed me that I only posted a measly 70 odd photos during the year. I love Instagram but I'm pretty rubbish at it if I'm honest, I don't have a theme and I also don't want a theme but on the other hand I never seem to have anything to post! I love capturing random moments but I also like pretty pictures so maybe 2016 will be a mixture of both, whatever I post though I want to make sure I post a lot more of it! When you're in chronic pain everyday and have an invisible illness it can be quite difficult to plan ahead and this is still something I'm getting used to. I definitely used to be one of those people who had the 5 years ahead of me planned out but this all changed when I had to leave education and my life changed so much. I ended up being so disappointed because I had life planned out even down to the smallest of details so to avoid that this year I'm just going to take everyday as it comes, see what happens and hopefully be a lot happier for making the change! 2015 for me was the year that my anxiety got a lot worse, mainly triggered by needing another operation. I've lived with anxiety for a few years but when my physical health got worse this in turn meant that my mental health got worse. I had more panic attacks last year than I ever had before and worried over stupid things, it's not only affected me as well but the ones I love in my life so it is time to take control. I'm going to be less afraid to ask for help this year when I need it and I'm going to try out lots of different techniques and activities to take back some control. 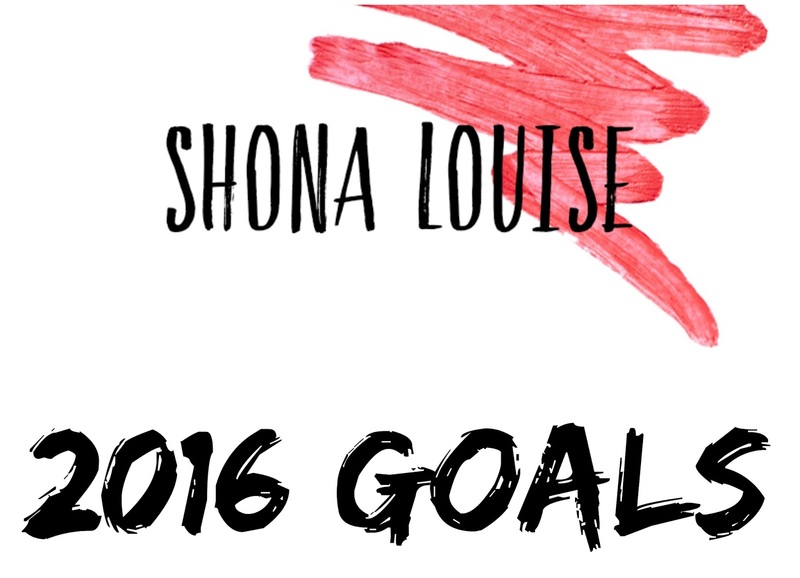 There are a few blog/statistics goals that I would love to reach in 2016! My twitter followers rocketed up towards the end of the year and I'm now close to 3.5k, I think reaching 5k is a pretty achievable goal for 2016 and I really hope I can reach it! Views wise I would love to get to 5,000 pageviews by the end of 2016, I'm not sure if I will get there but I do know that I'm going to be working so hard on my blog this year, I can't wait to see where it takes me! I'd love to know what one of your 2016 goals is, blog or life related! If you want to be more active on Instagram you should look at giving Project 365 a go! You simply take and publish one post every single day for the year! That will defiantly get you snapping more pics for sure! I'm giving it a go this year and can't wait to see how it goes! Great resolutions to aspire for! I definitely want to try and tame my anxiety more and just generally be positive :)Let's hope we can stick them out! It's totally true about commenting on other blogs - I'm doing my bit now and finding some amazing new blogs through doing it! Fellow spoonie here! I too need to take each day as it comes as I'm really bad with mixing my worries about flare ups and anxiety!